• Pasta dough, homemade or store-bought. Make ricotta mixture: In medium mixing bowl, add ricotta, eggs, garlic, pepper, parsley, and grated Parmesan cheese. Mix until ingredients are blended and there is a smooth consistency. Fill large pot with half gallon of water, bring to a boil, and add salt. Lay out dough and cut circular pieces with a ravioli cutter. (If you do not have a ravioli cutter, use lid from Pompilio’s Butternut Squash pasta sauce jar and cut around.) Add ricotta mix to the center of cut dough, brush egg wash* on edges, fold, and pinch with fork. Note: To make egg yolk wash, take 1 egg and 1 tsp water and beat together. Gently place ravioli into boiling water and let cook for 3-4 minutes. When they are finished they will rise to the top. Drain the pasta, reserving 1 cup of pasta water. Set ravioli aside. Heat a medium sized skillet on medium to high heat. 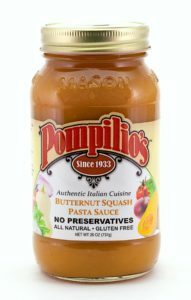 Add Pompilio’s Butternut Squash pasta sauce and the reserved cup of pasta water to pan. Once warm, transfer ravioli to sauce and gently stir, making sure they are evenly coated. Let cook for 3-4 minutes until done. Plate ravioli and top with Pompilio’s Butternut Squash pasta sauce.